This first chart measures the value of the dollar relative to six major currencies (CAD, EUR, GBP, SEK, CHF, and JPY). 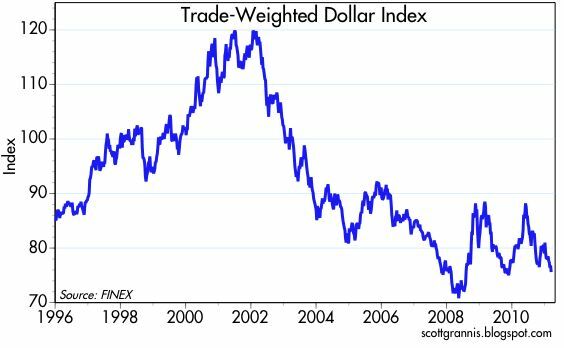 According to this measure the dollar currently is trading about 6% above its all-time low which was registered in March, 2008. 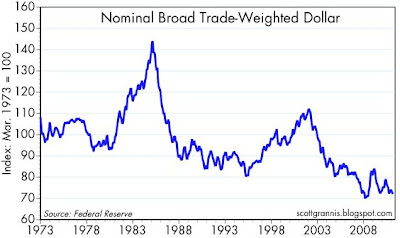 This next chart compares the dollar to a large basket (over 100) of trade-weighted currencies. It too shows that the dollar is still a bit higher than its all-time low, but only by a smidge. The third chart is arguably the best measure of the dollar's value, since it uses a very large basket of trade-weighted currencies and is also adjusted for inflation differentials between the U.S. and all those other countries. Here we see that the dollar (as of the end of January, the latest available datapoint) has now reached a new all-time low. If I were to extrapolate this chart based on trading data since January (during which time the dollar has continued to fall), the dollar would be around 80 on this chart, or about 18% below its long-term average of 97. This is a very sad commentary on the health of our currency, especially when we add to this the fact that the dollar also is at an all-time low relative to gold and most commodities. It's also not something that I expected. When a currency falls relative to a variety of objective standards (e.g., other currencies, precious metals, and a basket of commodities) then it is very hard to escape the conclusion that it is suffering from rising inflation. Inflation is simply a description of how much a currency is losing purchasing power. Official measures of inflation like the CPI are still registering very low inflation, but they suffer from flaws and are lagging indicators in any event. Prices at the supermarket can lag prices on the commodities exchange markets by many months. There is no shortage of reasons for the dollar's weakness. For one, the Fed has been overtly and aggressively expanding the availability of dollar liquidity, and when the supply of something increases sharply it is logical to expect its value to decline. Demand for the dollar has been fairly decent in spite of the Fed's efforts to debase the dollar's value—fueled no doubt by evidence that the U.S. economy is gaining strength—but not enough to absorb the additional supply. Second, the world has been rocked by new tensions in the Middle East, and by the devastating Japanese earthquake, but the U.S. has failed to display leadership. Three, Congress is still dithering over the course of fiscal policy, at a time when our budget deficit is near a post-War high, and the federal government's projected unfunded liabilities are clearly on an unsustainable trajectory. President Obama's budget completely ignored these facts, thus contributing to the perception that the U.S. is sorely lacking in leadership. I remain confident that things will improve before the year ends, but for the time being markets are clearly burdened by a variety of legitimate concerns, with little or no support from the folks in Washington. 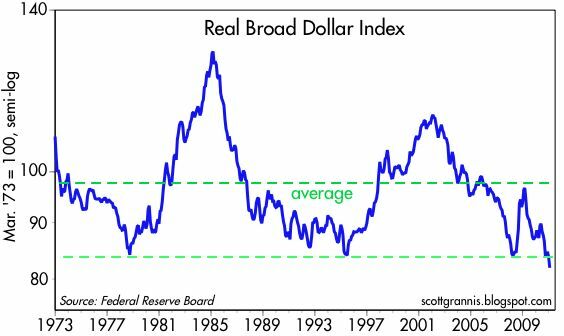 Stepping back, I note that the new all-time weakness of the dollar is yet another in a long list of valuation measures that suggest that the market still is priced to a healthy dose of fear, uncertainty and doubt. It's difficult if not impossible to argue that there is any excessive or unwarranted optimism out there when the dollar is at an all-time low, commodities and gold are on fire, credit spreads and the Vix index are still substantially above levels that might be termed healthy, equity earnings yields are higher than PE ratios, and Treasury yields are in the neighborhood of 2-3%. Thus, to be bearish you have to believe that the market has underestimated the gravity of the problems we face, and you have to believe that the economy will surely falter. You have to ignore the budding signs of recovery, and distrust the economy's proven ability to adapt and overcome adversity. Moreover, you have to believe that the Tea Party will be unable to turn the tide of fiscal policy, and that Republicans also will fail in their attempts to restore sanity to Congressional spending habits. I'm not ready to throw in the towel on this, not by any means. I hope the dollar goes even lower. US exports are surging, good news for American industry and workers. As for "leadership" I sure hope we do not get involved in another exceedingly expensive nation-building mission in Libya. The Iraqistan follies carry a $3 trillion price tag (and counting), and Obama has us in deeper into Afghanistan than ever. If Gaddafi falls, but anarchy ensues, then we become morally culpable to restore order, and nation-build. Looking to spend another trillion of our money on an overseas hellhole, Obama? You are getting us close to that goal. Bernanke remains an island of sanity in DC. His QE is the one government program that actually works. I just wish Bernanke was more aggressive. The dithering, feeble Bank of Japan stance is not one that works, as has been proven out over the last 20 years. Evidently you believe that you can change the terms of trade by changing the unit of account? Could you explain to me how this works. Don't forget to include the chapter outlining why oil and other commodities don't increase in price as the currency falls in real terms . Well, should a government pursue a "strong" dollar or a "weak" dollar? Or be neutral, let the market do it? In terms of classic economics, is there virtue in a "strong" dollar, more so than a "weak" dollar? When some elements in the USA call for a "strong" dollar, is that also not artificial currency manipulation? The bigger our exports, the bigger our GDP. I like prosperity. I like a bigger GDP. The good news is that exports surge follow a lower exchange rate for the dollar. It takes time to set up foreign sales, trade routes etc. If the global recovery continues, we could see an epic surge in exports, aided by a "cheap" dollar. Is it my imagination, or does the bottom chart look like Mt. Fitz Roy? "Is it my imagination, or does the bottom chart look like Mt. Fitz Roy?" I don't support a strong dollar or a weak dollar and there can be no such thing as "neutral" when the Fed is the creator of all dollars. There is a huge benefit to a stable dollar, as you can trust the price signals it sends, with out the need to guess what monetary distortions might also be included in a price. It makes long term contracts easier to enter into with both parties assured of that their exchange will continue to be as beneficial in the future as it was on the day they entered into it. It eliminates the need to hedge contracts against fluctuations in the currency. It increases capital formation with investors looking to returns from equity rather than hedging their shrinking dollars in bets on commodities. You haven't thought through what happens when a country devalues their currency. The dollar has been falling in value for the past 7 years. The economies current poor performance is in large part due to the weakening dollar. If you want more of what we are experiencing continue to champion a weaker dollar. 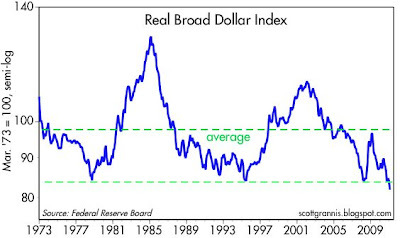 The real broad dollar index chart was very revealing, please keep it updated. I would expect the trend to continue as the US continues to engineer an inflationary default.